Find your way through this maths maze by ordering your answers 1 through 10. This double-whammy of an activity will have kids eager to add! Approach addition facts in a more creative way with this maths search! 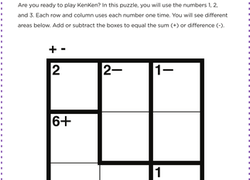 This addition and subtraction KenKen® puzzle is a perfect challenge! Your students will need their addition facts and a bit of logic to solve this KenKen® maths puzzle. Get ready to play KenKen®! 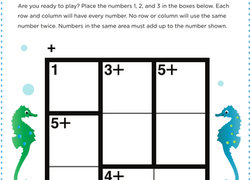 This beginner puzzle requires addition facts and a lot of logic! 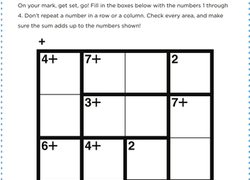 This maths worksheet tests your child's addition and riddle-solving skills. Find out the answer to the riddle, "Which month has 28 days?" Why did the number 6 hate the number 7? 7 8 9 (seven ate nine)! Find more funny riddles to solve with this awesome addition worksheet. Practise your addition and multiplication skills in preparation for factoring equations using these baseball themed puzzles! 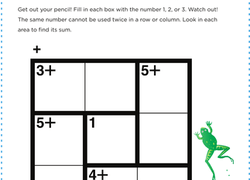 Maths search puzzles are a fun and clever way of helping kids review maths facts. Print 'em out and see how many your kid can find! 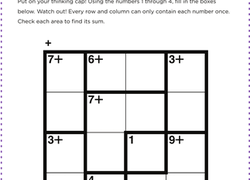 This KenKen maths puzzle helps build addition and logic skills! This addition puzzle is the perfect introduction to KenKen®, a maths logic game from Japan! This addition puzzle is perfect for getting your student started with KenKen®!